Your corporate image depends on the customer service you provide. A once unsatisfied client is unlikely to use your product again. That’s why you should take every opportunity to deliver a great customer experience. One of the best ways to do this is to automate your customer service with AI chatbots. In this post, we’ll talk about the best virtual assistants to improve your customer service. We’ll also describe the long-term benefits they may bring to your business. More and more businesses are choosing AI chatbots as part of their customer service team. There are several reasons for that. Chatbots can answer customers’ inquiries cheaply, quickly, in real-time. 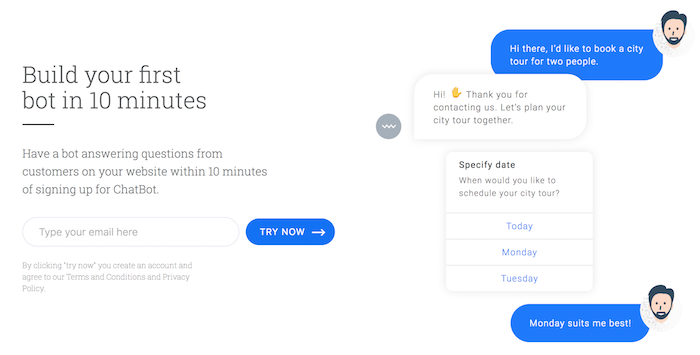 Another reason is the ease of installation of such chatbot: once you have a fine live chat app, it takes a couple of minutes to integrate a chatbot with it. Here are the top advantages of using AI chatbots for customer service. Chatbots don’t need to sleep. They can immediately tackle issues no matter if it’s 4 am or 9 pm. This is crucial for companies targeting millennials (who can be impatient). This allows you to improve customer support and the customer experience. Chatbots can handle a high volume of requests with similar responses. This makes them perfect for dealing with frequently asked questions. Besides, chatbots don’t need time to search for answers as human agents do. This helps reduce service time as much as fivefold and operating costs by as much as 66 percent. Chatbots can direct customers to a live agent if the AI can’t settle the matter. This lets human agents focus their efforts on the heavy lifting. AI chatbots also increase employee productivity. Globe Telecom automated their customer service via Messenger and saw impressive results. The company increased employee productivity by 3.5 times. And their customer satisfaction increased by 22 percent. AI chatbots make fewer errors while answering customer inquiries than human agents do. Why? Because their cognitive technology interprets customers’ responses and provides accurate, automated answers. Chatbots have a lot of memory. This reduces the chances of misinterpreting a query or offering an incorrect solution. Chatbots can strike up a conversation with any customer about any issue at any time of day. They engage in friendly interactions with customers. Besides, virtual assistants only give a bit of information at a time. This way they don’t tire customers with irrelevant and unnecessary information. Chatbots can maintain conversations and keep customers on your website longer. Generally, companies engage in passive customer interactions. That is, they only respond to inquiries but don’t start chats. AI bots can begin the conversation and inform customers about sales and promotions. Moreover, virtual assistants can offer product pages, images, blog entries, and video tutorials. Suppose a customer finds a nice pair of jeans on your website. In this case, a chatbot can send them a link to a page with T-shirts that go well with them. Chatbots can perform a range of simple transactions. Telegram bots let users transfer money, buy train tickets, book hotel rooms, and more. AI chatbots are especially sought-after in the retail industry. WholeFoods, a healthy food store chain in the US, uses a chatbot to help customers find the nearest store. The 1-800-Flowers chatbot lets customers order flowers and gifts. 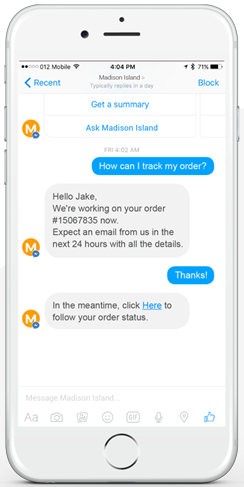 In the image below, you can see more ways you might use AI chatbots for your business. Chatbots are especially effective where you can predict questions and script answers. A professor at Georgia Tech University created a chatbot to act as a teaching assistant. It answered students’ queries for a computing class. Three months after launching, the chatbot could answer questions with 97 percent accuracy. Are you already tempted by the advantages of virtual assistants? Then it’s time to enhance your customer service with a brand new AI-powered chatbot. But what chatbot should you use? Here’s a collection of lovable chatbots. Each has its own unique feature set. Choose the one that suits your business best. With ChatBot you can create any bot you want and integrate it with apps and services you like. Quick start with a template and customize it by dragging and dropping responses and actions to compose various bot’s answers and decide its behavior. 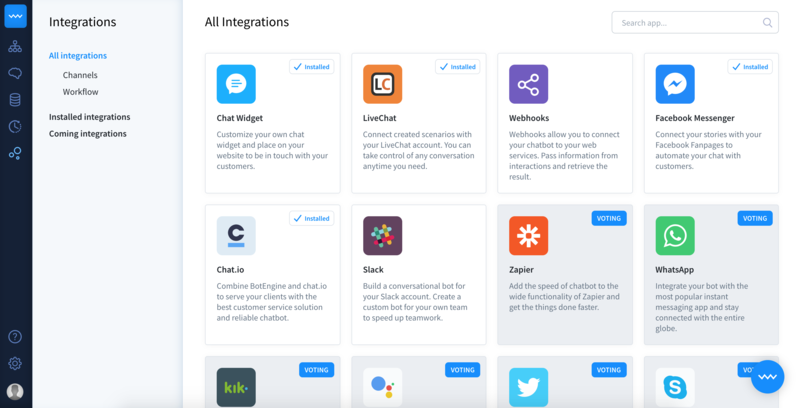 When the scenario is ready, use the customizable chat widget to instantly add the bot to your website or choose from many available platforms such as Facebook Messenger and Slack to integrate it with. You can also automate reputable parts of your customer help by adding ChatBot to the third-party live chat services. Improve your bot on a daily basis using the training tool powered by the machine learning to include unrecognized queries in your scenario. The bot can also communicate with external services so you can send the collected data directly to your CRM and database. Clare.AI is a frontend assistant that provides modern online banking services. This virtual assistant combines machine learning algorithms with natural language processing. The Clare.AI algorithm is trained to respond to customer service FAQs, arrange appointments, conduct internal inquiries for IT and HR, and help customers control their finances via their favorite messaging apps (WhatsApp, Facebook, WeChat, etc.). 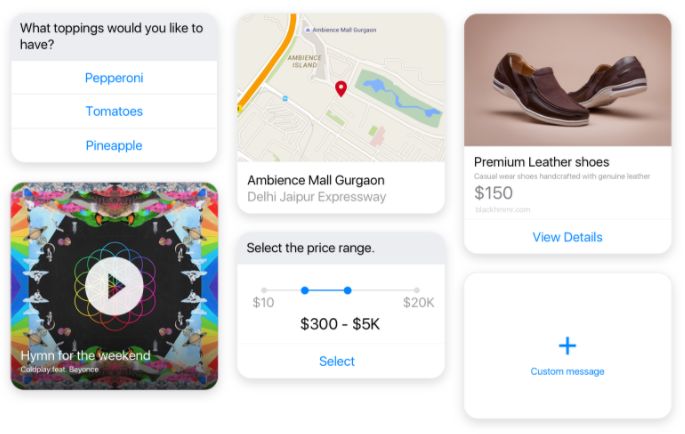 It can even draw a chart showing customers how they’ve spent their money. the kind of product the customer wants to get information about. What’s more, NanoRep has smart channeling capabilities. In other words, it can direct customers to relevant third-party channels for help. Moreover, Nanorep can deploy intent classification that only requires small training sets. Forrester included Nanorep among its top 10 chatbots for enterprise customer service. Twyla is an intelligent conversational chatbot that manages helpdesk and live chat systems. Twyla works within enterprise systems such are ERPs and CRMs. The company promises to save you up to 90 percent on phone calls. structured data (like chat history). Twylla also allows you to track KPIs and measure return on investment of the service bots you’re using. Botsify is a simple-to-integrate AI chatbot that lets you forget about programming. You can design customized templates in a few clicks using a drag-and-drop interface. The chatbot compares user queries (like names or URLs) against its knowledge base. You can even identify questions the chatbot has failed to handle and teach it new things over time. Botsify understands that chatbots can’t be 100 percent accurate yet. So the company lets a human agent take over chats anytime. Furthermore, the company promises integration with Salesforce, Smooch, Zendesk, and Hubspot soon. What can I expect from an AI chatbot? Nowadays, people are eager to talk to businesses via new channels. Yet customers don’t expect to have deep human-like conversations with automated technology. They only want to get the information they need without unnecessary hassle. AI chatbots can perfectly meet customers’ expectations of how customer service should operate. When implemented well, virtual assistants can make the customer experience efficient. In fact, they can resolve 80 percent of chat sessions. Once people get comfortable using chatbots, there will be a huge demand for them. Widespread adoption will take hold. Keep in mind that more than one-third of businesses that exist today won’t survive the next 10 years. Isn’t it time to work on your future? Daryna is a skilled content writer at RubyGarage completely fascinated by IT and startups nature. 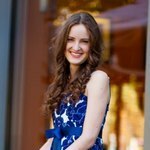 Daryna doesn't miss a chance to search and write about the latest tech breakthroughs and best practices of entrepreneurship.